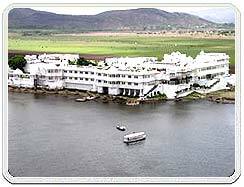 Lake Palace or Jag Niwas was built in 1754 by Maharana Jagat Singh II who gave his name to this elegant white building. The Lake Palace Udaipur is a palace on an island in the middle of Lake Pichola girdled by hills, was the summer residence of the rulers of Mewar. Today this pleasure palace is a luxury hotel like none other in the world. The Lake palace was built in the 17th century on a natural foundation of 4 acers of rock. It was initially called Jagniwas after its founder Maharana Jagjit Singh. The Maharana, ruler of Jaipur from 1628 to 1654, was very friendly with Mughal Emperor Shah Jahan and encouraged his craftsmen to copy some of the glories of his incomparable buildings at Agra. The successive rulers used this cool haven as their summer resort, holding their regal durbars in its courtyards. These courtyards lined with columns, pillared terraces, fountains and gardens all add to its impressive image. 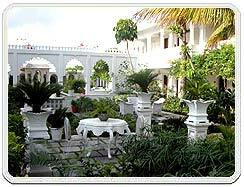 Lake Palace houses 83 rooms including 17 beautiful suites and 53 Deluxe rooms. The rooms and the suites of the hotel are beautifully designed; each having a particular theme & decorated with textiles and handicrafts of the region. The rooms are decorated with cusped arches, inland stones of pink and green lotus leaves and painted mirrors. Apartments like the Bada Mahal, Kush Mahal, Ajjan Niwas, Phool Mahal and Dhola Mahal. The royal banquet rooms are now reception rooms, bars and restaurants. Air : Dabok Airport is 24 km. from Udaipur city. 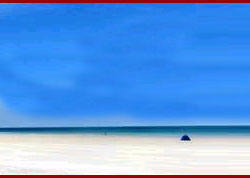 Linked by daily Air Service from New Delhi, Jaipur, Jodhpur, Ahmedabad, Aurangabad and Mumbai. Rail : Udaipur is connected to and from Chittrogarh, Ajmer, Jaipur and Delhi. Road : A wide network of bus services link Udaipur from various destinations like Ahmedabad, Ajmer, Delhi, Jaipur ,Chittrogarh, Indore, Kota, Mount Abu and Mumbai.